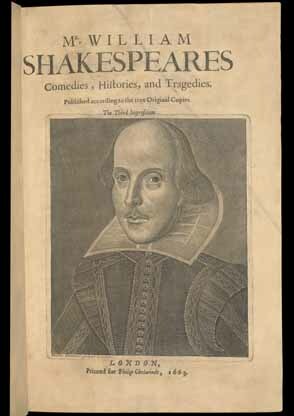 What is the Third Folio of William Shakespeare? 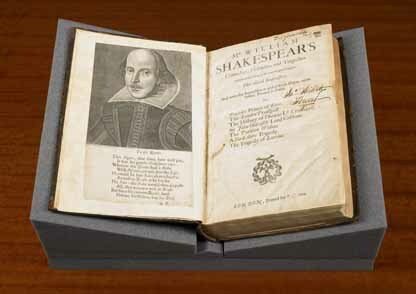 Ten years after the publication of the Second Folio, Civil War broke out. The London theatres were closed and after seven years the monarch, who had owned a copy of the Second Folio, was executed by the parliament for the first and last time in English history. 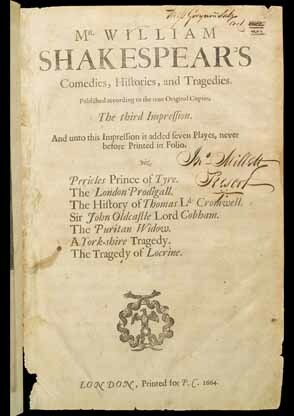 When the English monarchy was restored in 1660 in the person of the eldest surviving son of the executed king, London theatrical activities were also resumed and Shakespearean plays, whatever forms they were actually staged in, were among the early repertoires recorded in The London Stage, 1660-1800 (Part 1:1965): Othello, Henry IV Part I, Hamlet, Twelfth Night, The Merry Wives of Windsor and Romeo and Juliet were to be found in the first three years of this new era. 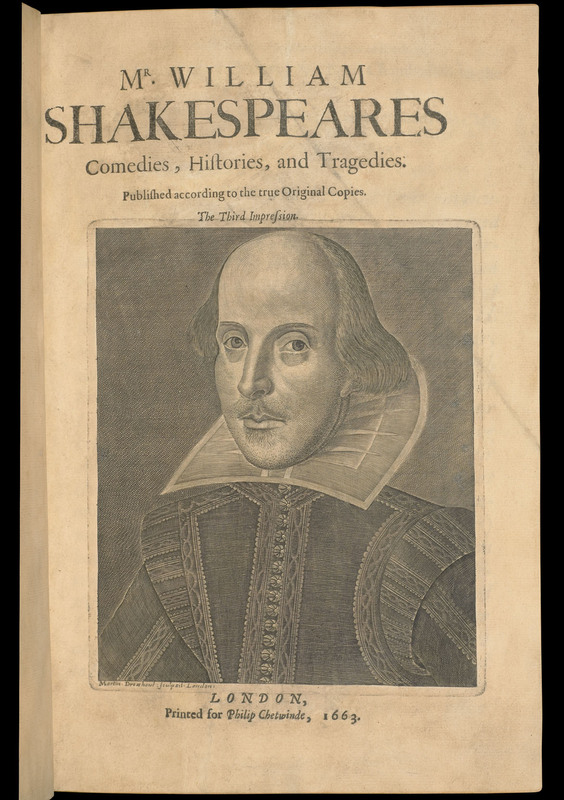 This was the time when the Shakespeare Folio was printed for the third time, which was also the first Shakespearean publication since the Restoration. The years of the interregnum, roughly a period of twenty years 1642-1660 saw only three plays and a poem in reprint anew in contrast to twenty nine publications including the First and the Second Folios (re)printed in prewar twenty years 1622-1641 according to `Chronological appendix' in Andrew Murphy's Shakespeare in Print (2003). This source also tells us that the next period of twenty years starting from the Restoration 1661-1680 was to witness seven including two issues of the Third Folio itself and Two Noble Kinsmen in the Second Beaumont and Fletcher Folio. Philip Chetwind, the publisher of the Third Folio, had presumably taken over the copyrights covering those plays which belonged to Robert Allot by way of marriage to his widow and the copyrights regarding the other plays were thought to be cleared through negotiation with Ellen Cotes, widow of Richard Cotes, brother of Thomas Cotes (Henry Farr, `Philip Chetwind and the Allott Copyrights', The Library, 4th series, 15 (1934-5): 129-60). The printing of the Third Folio carried out by the shared effort of three printing houses is that of ` page-for-page reprint of the Second Folio so far as the text is concerned' as W.W. Greg describes it. The layout of the preliminaries are changed although the materials are identical: Milton's poem as well as Digges's are laid out so as to occupy one whole page each. In 1664 Chetwind published the second issue of the Third Folio. In the second issue, Chetwind added to the volume a hundred-page new section that consisted of the seven plays, viz., Pericles, The London Prodigal, Thomas Lord Cromwell, Sir John Oldcastle, The Puritan, A Yorkshire Tragedy, and Locrine to list in the order of appearance. 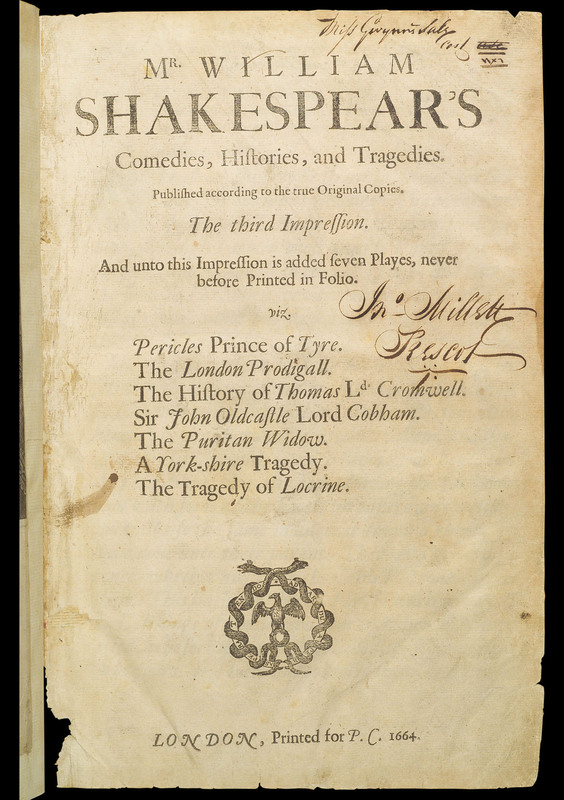 These plays had already been printed earlier in Shakespeare's lifetime with such title page announcements as `Written by William Shakespeare' or `Written by W.S.' Pericles has since been established among Shakespearean cannon while the other six plays are now considered apocryphal. F1,F2 There is more in it; Cosen Ganimed. F3 There is no more in it; Cosen Ganimed. This change, though not retained after Theobald's edition in 1733, is nonetheless defendable, Black and Shaaber write, because it is done "on the supposition, presumably, that it is dramatically inappropriate for Celia to excite suspicions in Oliver's mind, that she should, on the contrary, protect Rosalind's disguise and try to allay them" (p. 55). Arden 3 (2006) edited by Juliet Dusinberre reproducing F1 reading cites Dr Johnson's note here: "Celia's agitation leads her to forget to act the part of Ganymede's sister." This is adopted by the subsequent editors and Arden 3 cites the Third Folio in its critical apparatus although Dusinberre is cautious enough to cite Jeffrey Masten's argument `that [the First Folio's] `his' is a deliberate recognition of the `joining' of Orlando with a boy actor, which would suggest that Rosalind is not wearing wedding clothes' in her foot notes.